A potent fighting force that changed the course of the Civil War, the Army of the Cumberland was the North's second-most-powerful army, surpassed in size only by the Army of the Potomac. The Cumberland army engaged the enemy across five times more territory with one-third to one-half fewer men than the Army of the Potomac, and yet its achievements in the western theater rivaled those of the larger eastern army. 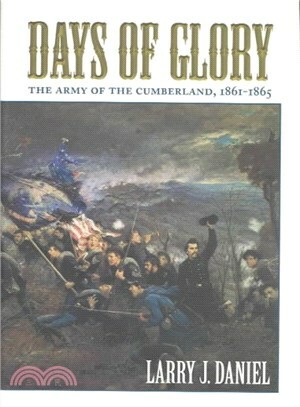 In Days of Glory, Larry J. Daniel brings his analytic and descriptive skills to bear on the Cumberlanders as he explores the dynamics of discord, political infighting, and feeble leadership that stymied the army in achieving its full potential. Making extensive use of thousands of letters and diaries, Daniel creates an epic portrayal of the developing Cumberland army, from untrained volunteers to hardened soldiers united in their hatred of the Confederates. Larry J. Daniel is the author of Shiloh: The Battle That Changed the Civil War; Cannoneers in gray: the Field Artillery of the Army of Tennessee, winner of the Fletcher Pratt Award; Soldiering in the Army of Tennessee; and Island No. 10: Key to the Mississippi Valley. A prolific speaker on the Civil War Round Table circuit, he lives in Murray, Kentucky, where he is the minister of First United Methodist Church.